The best way to celebrate the Kentucky Derby is with Derby Pie Brownies. 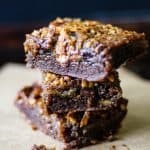 Chocolate Brownies covered in bourbon, toasted pecans, and chocolate chips! Add the sugar, vanilla, and eggs. Add the flour and stir until mixed through. Pour into a 9×13 pan lined with non-stick foil or parchment paper. Mix brown sugar, corn syrup, butter, eggs, and bourbon until combined. Add the toasted pecans and chocolate chips. Bake at 350F for 35 minutes until center is set.